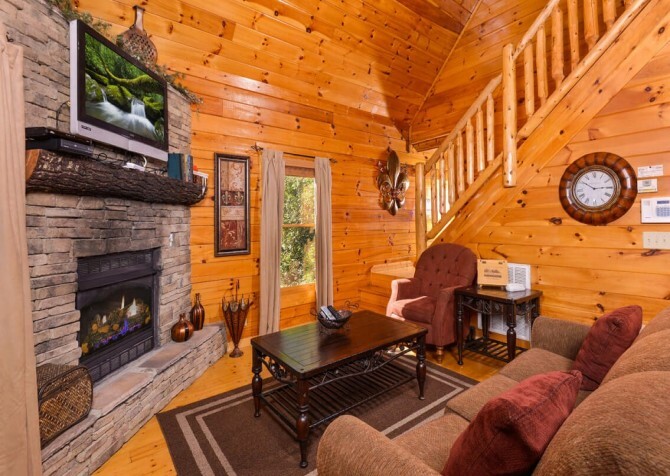 Bring the whole family—we’re talking kids, pets, and all—to the Smokies when you book your stay at As Good As It Gets, a two-bedroom cabin less than seven miles from downtown Gatlinburg. 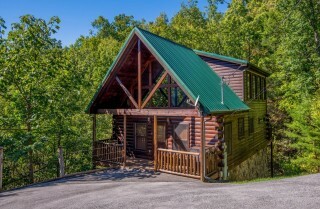 When it comes to what’s good about this cabin, the name says it all—this is “as good as it gets” among log cabins made for families and small groups of up to eight people. Enjoy a modern delight with stunning updates and comfortable living spaces in As Good As It Gets, as well as a pet-friendly atmosphere! Besides all that, this spacious cabin comes with deluxe accommodations, including an indoor jetted pool, outdoor hot tub, gas fireplace, and gas grill. 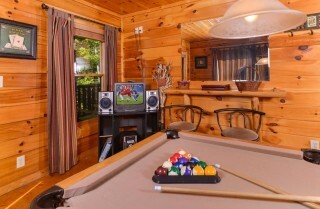 So if you’re looking for a Smoky Mountain retreat nestled in the woods that’s only a stone’s throw from the fun of Gatlinburg, bring the family to As Good As It Gets this year. Gatlinburg is home to dozens of exciting attractions and events that we hope your family makes time for on your Smoky Mountain vacation. Visit the historic Arrowmont School of Arts and Crafts or ride the Aerial Tramway at Ober Gatlinburg. 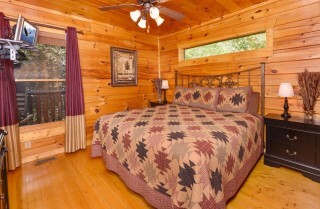 Whatever you decide to do, you’ll look forward to a comfortable place to relax at the end of the day. The living room of As Good As It Gets has everything you’re looking for in a relaxing living space for late afternoon glasses of wine or late night movie watching. Enjoy a comfortable couch with a coordinating plush armchair. Enjoy a large coffee table where you can store your drinks or a tray of snacks—or even play a game of Hearts with the family. 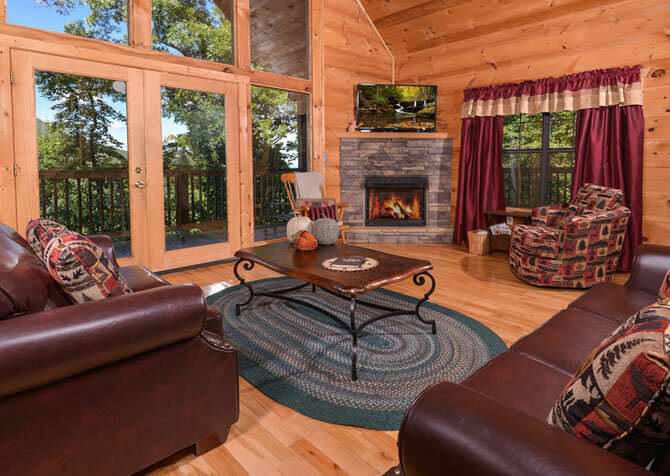 There’s also a large flatscreen TV and DVD player, a gas fireplace surrounded by beautiful stonework, and high ceilings with windows all around, offering views of the Smoky Mountain woods you won’t find in any downtown hotel. 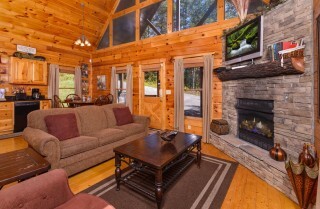 So relax, unwind, and enjoy this living room with your family and even your furry friends when you stay at As Good As It Gets. The kitchen at As Good As It Gets has everything you expect to find in a modern mountain retreat. The open-concept design of the cabin leaves the kitchen open to the living room and dining room, and inside, you’ll enjoy the black and stainless steel appliances as well as granite countertops. 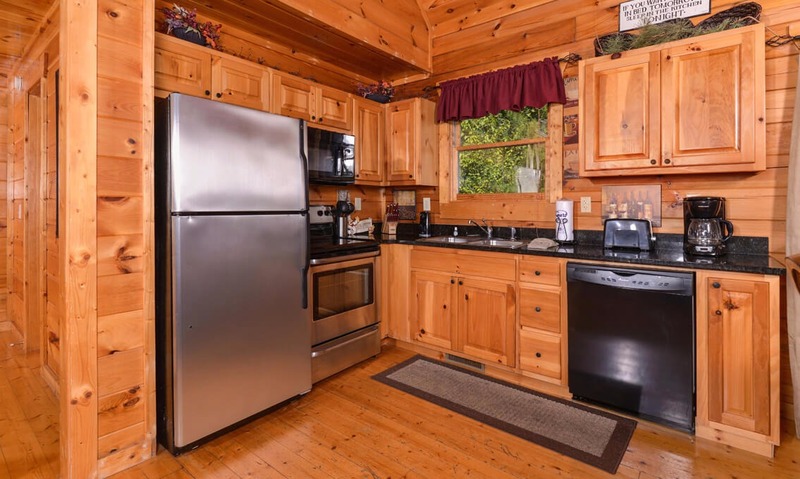 Plenty of cabinet space means having the storage you need for snacks, water bottles, and whatever else you might have brought for your trip. As Good As It Gets even provides the little things—a toaster for easy breakfast options, a coffeemaker for those who need their fix, and cookware for the nights you decide to save a little money and cook in the cabin. 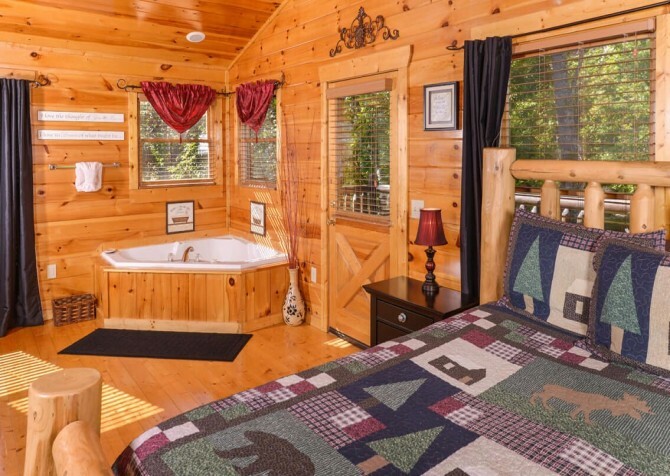 There’s even a window over the sink so you don’t miss the views no matter where you are in the cabin. Directly beside the kitchen is the cozy dining area of As Good As It Gets. 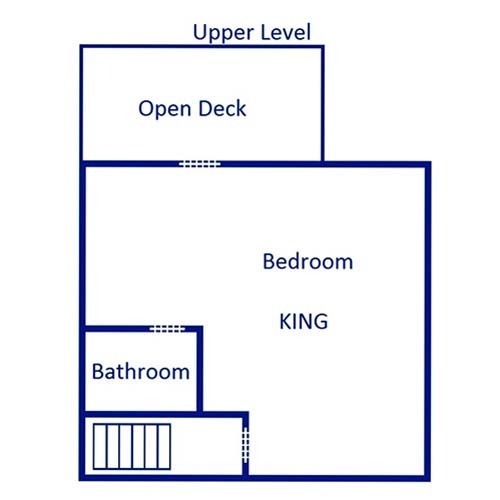 This space features a large round table with four chairs and opens up to the living room so extra guests can find a comfortable place to sit without missing any of the dinnertime conversation. 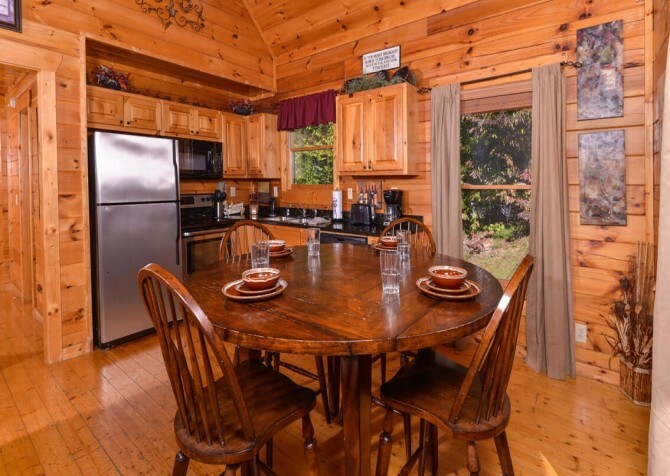 The dining area also features one-of-a-kind views for your in-cabin meal experience with windows all around displaying the Smoky Mountain trees. And just so you know, if you want to stay in the cabin but cooking isn’t your thing, we have solutions for you. Try one of our vacation packages, which include gift baskets or even an entire romantic meal delivered right to your cabin door. We also have an in-cabin chef who will whip up a favorite dinner for your family to enjoy without you having to lift a finger. 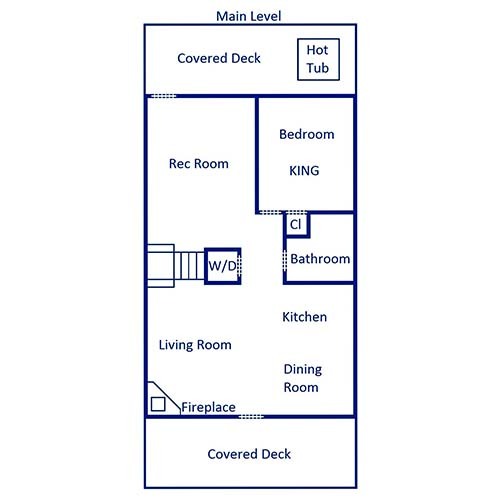 Ask our reservation specialists for more information about any of these options. 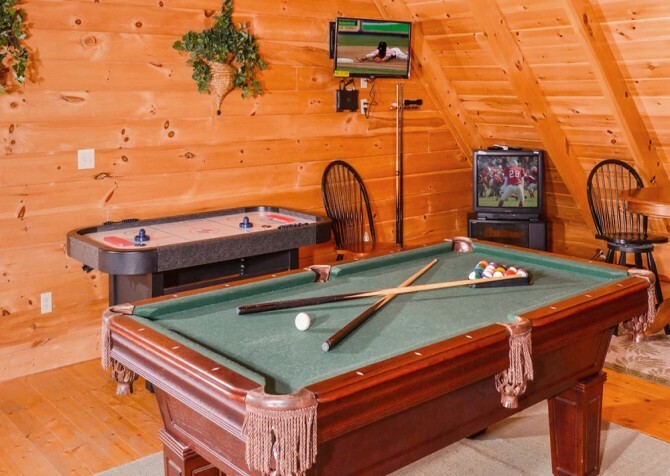 From the main floor of As Good As It Gets, you can step down to find a large, airy rec room that’s perfect for kids, teens, or fun-loving adults. 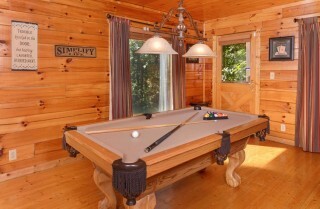 Enjoy a standard-size pool table, where you can challenge each other to an 8-ball tournament or practice your shot. 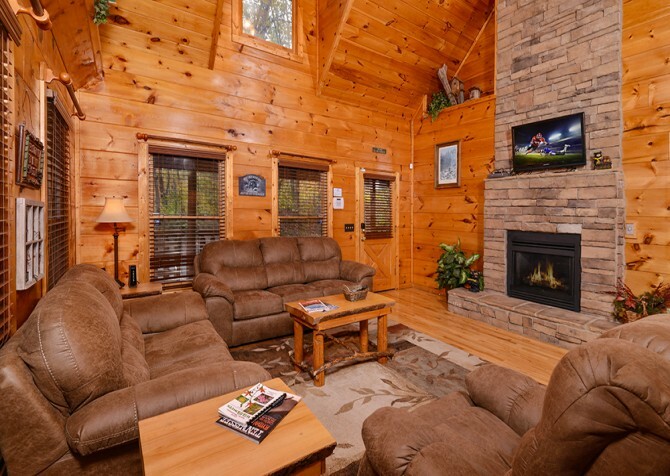 Nearby, you’ll find comfortable seating with the large suede couch and padded bar stools. 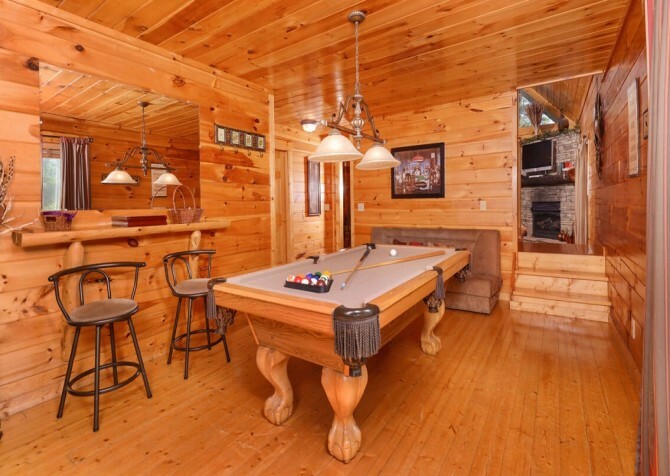 There is also a bar area where you can rest your drinks, play a game, or set out a selection of your favorite snacks to munch on between turns. The TV and stereo/CD player are available for you to use in this space as well, providing great entertainment options on rainy afternoons or days you decide to hang out in the cabin. 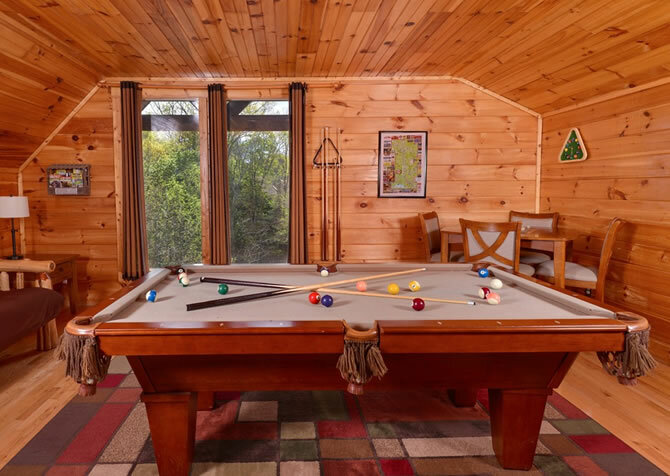 And one of the best features of the As Good As It Gets rec room is the opportunity to view the Smoky Mountain trees while you play, including from an oversized window across the back wall. Shopping in The Village or hiking through the Great Smoky Mountains National Park is a great way to spend your Gatlinburg vacation, but when it’s time to crash at the end of the day, you’ll appreciate the comfortable sleeping spaces of As Good As It Gets. Two bedrooms can be found in this cabin, along with two full-size bathrooms. This should provide you with enough accommodations for eight guests. The bedrooms are warmly decorated with dark-stained furniture pieces, mountain décor, modern lamps and fixtures, and all the comforts of home, from ceiling fans to personal TVs. The master bedroom of this cabin is a large, open room with windows all around that features a king-size bed, porch access, and an indoor jetted tub. 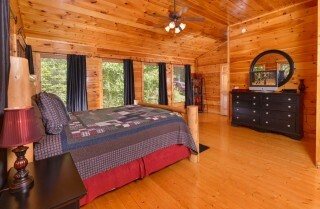 The second bedroom also comes with a king-size bed and a window with views of the backyard. 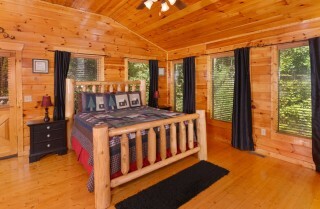 For extra sleeping space, take advantage of the sleeper and futon provided by this cabin. At the end of the day, everyone in your group will find As Good As It Gets a cozy place to retreat after those long days of adventuring downtown. The wooded lot surrounding As Good As It Gets makes this cabin feel like your own private oasis in the Smoky Mountain trees. Enjoy gorgeous tree-studded views all around, either from the windows throughout the cabin or from your very own rocking chair porch. 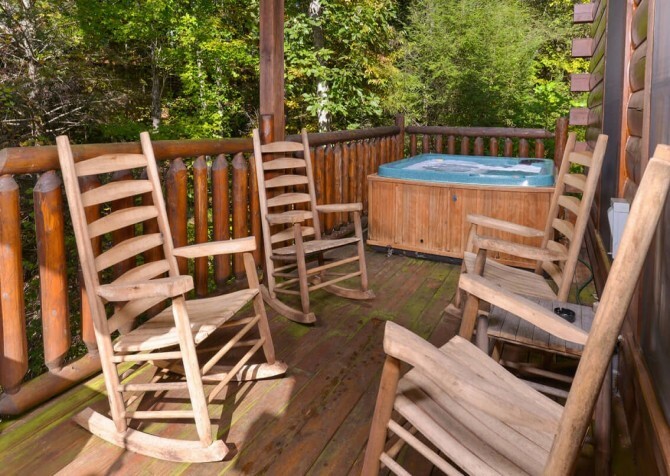 The porch comes with four rocking chairs that your guests can enjoy and a matching end table for your morning cup of coffee or your afternoon glass of sweet iced tea. 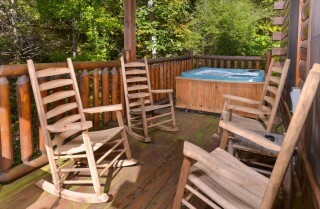 Also, be sure to take advantage of the outdoor hot tub that’s located to the right of the rocking chairs on your back porch. As Good As It Gets provides you with plenty of ways to unwind and soak in the ambiance of the Smoky Mountains from your own backyard. 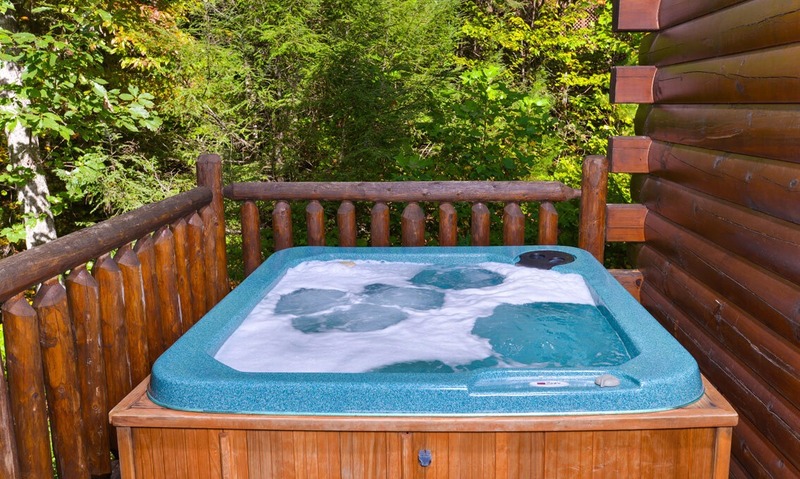 As an added bonus, As Good As It Gets comes with these extra amenities, making your stay in the Smoky Mountains convenient, worry-free, and full of fun: a gas grill (perfect for family barbecues), free Wi-Fi (keep up with our blog from your cabin for the latest information about upcoming events and hot new attractions), and a DVD player (rent new releases while you’re in town or bring along for old favorites for a movie night in the mountains). 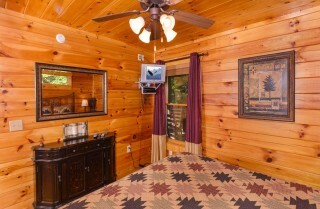 And did we mention this cabin is pet friendly? Plan a vacation this year that everyone in the family can enjoy when you stay at As Good As It Gets! One of the top attractions in Galinburg, Ripley’s Aquarium features more than 10,000 exotic sea creatures and offers you exciting ways to view and interact with them. Visit their website for more information about behind-the-scenes tours and hands-on exhibits that are perfect for the whole family. Ride the incline 300 feet up to the top of the mountain to enjoy a mini golf experience in Gatlinburg like no other. Choose from two 18-hole courses, and immerse yourself in hillbilly culture with old tractors and outhouses all around. If you’re over 21, we invite you to get your taste of an old Tennessee tradition at the Ole Smoky Distillery. Enjoy local-made moonshine in a wide variety of flavors ranging from apple pie to sweet tea.